The Middle Years Development Instrument (MDI) is a powerful tool we can use to understand how children are living and thriving in our schools and communities. By asking children to tell us about their daily habits, feelings, relationships, and environments, we honour their voices and enable them to work with us to support their development. The valuable research collected by the MDI informs the local change efforts of schools and communities across Canada, and supports ongoing collaborative national and international research into the determinants of well-being in the middle years and the efficacy of programs designed to increase well-being. Why do we care about the middle years? Experiences in the middle years — ages 6 to 12 — have critical and long lasting effects. During this time, children are experiencing significant cognitive, social and emotional changes that establish their lifelong identity and set the stage for adolescence and adulthood. The pace of brain growth during the middle years is at its peak. Children become markedly more self-aware and aware of others, vastly broaden their capacity for abstract thought, and begin to develop new and intricate senses of humour. The ability to learn new skills and habits is dramatically increased, making the middle years a critical period for shaping the foundation of well-being. Socially, children in the middle years begin to seek autonomy, changing their relationships with adults in the family and forming new relationships with adults during and after the school day. At the same time, their relationships with peers become more intimate and friendships play a more central role in their lives. Along with these rapid internal changes, children’s external environments are also changing. Classroom environments become more structured, adults’ expectations of behaviour and performance increase, and children begin to internalize pressures to succeed in academics, sports, or other pursuits that may have once been just for fun. Unstructured leisure time decreases and children have less down time during the day. The Middle Years Development Instrument (MDI) is a self-report questionnaire that asks children in Grade 4 and Grade 7 about their thoughts, feelings and experiences in school and in the community. The MDI is not an assessment for individual children. Instead, it is a unique and comprehensive population-based measure that helps us gain a deeper understanding of children’s health and well-being during middle childhood. 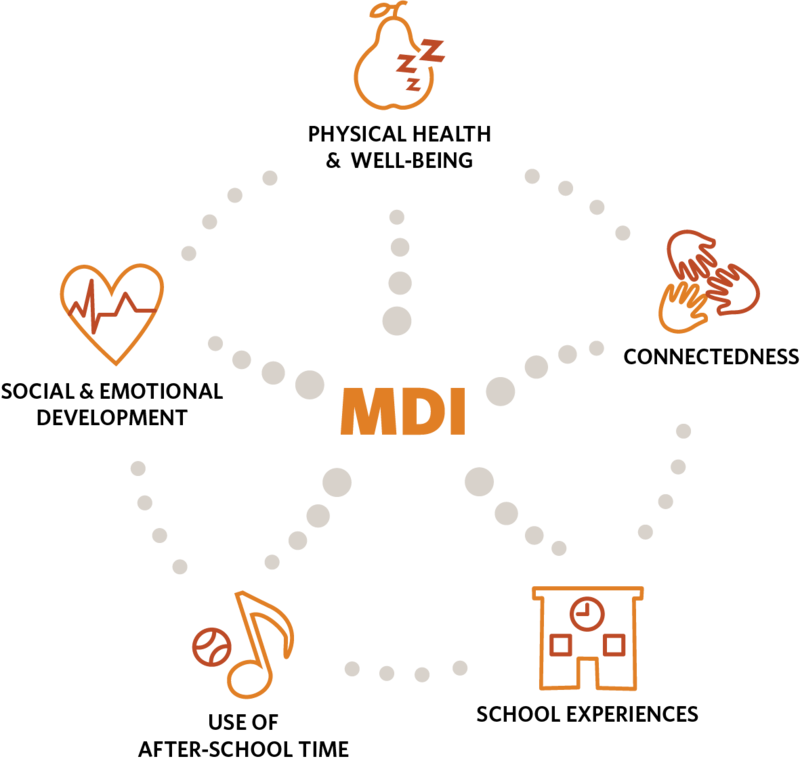 The MDI uses a strengths-based approach to assess five areas of development that are strongly linked to children’s well-being, health and academic achievement. It focuses on highlighting the protective factors and assets that are known to support and optimize development in middle childhood. These areas are: Social and Emotional Development, Physical Health and Well-Being, Connectedness, Use of After-School Time and School Experiences. You can learn more about these five dimensions here. Each year, HELP partners with school districts across Canada to deliver the MDI survey. Participating school districts receive training from HELP to administer the MDI for students in Grade 4 and Grade 7 in one or more of their schools. The MDI is offered annually over a 4-6 week period, and takes 30 to 90 minutes of students’ time to complete, depending on the grade and reading level. Students complete the MDI via an online, password-protected form consisting of 77 (for Grade 4) or 101 (for Grade 7) questions designed to measure the five dimensions of well-being. The survey is completely voluntary; parents/guardians and students themselves can opt-out at any time—even during the survey. The collected responses are encrypted and stored in a highly secured data-storage facility at the University of British Columbia (UBC). This data is then analyzed and released in reports to schools and communities to develop a picture of well-being. Any information that could identify the student is removed from the data before sharing. What makes the MDI different? The MDI was developed in 2006 through a uniquely collaborative process. A UBC research team led by Dr. Kim Schonert-Reichl worked with scientific experts, community members, educators and children to create the questionnaire. You can read more about the pilot study that led to the MDI, and see the current questionnaire in full. The MDI provides data on groups, not individuals. 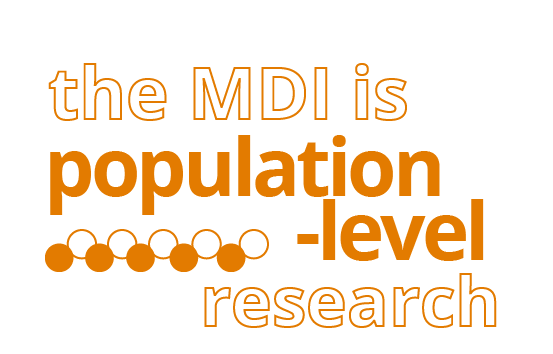 The MDI is a population-level research tool. This means that although individual students complete the questionnaire, the results are not used to evaluate individual children, nor are they used to rank teachers, neighbourhoods, schools or school districts. The value of MDI data lies not in assessing the strengths and needs of one student or one class, but in seeing patterns across a community or district, and across time for groups of children during middle childhood. 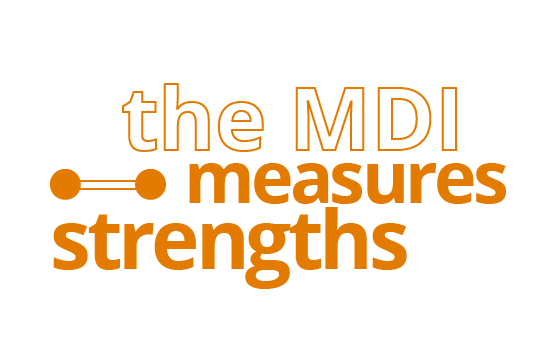 The MDI focuses on strengths. 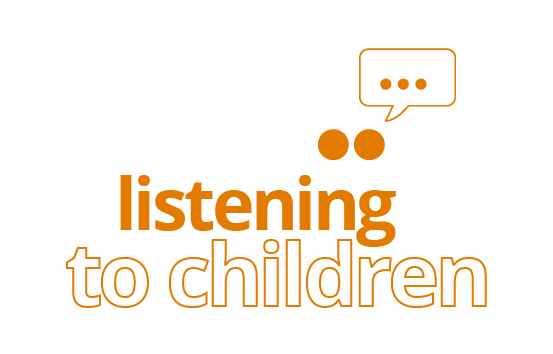 The questions on the MDI are designed to ask children to reflect on the positive aspects of their lives, and provides them the opportunity to share these reflections with adults, often for the first time. MDI data can show schools and communities where they are already strong and point the way to growing even stronger. 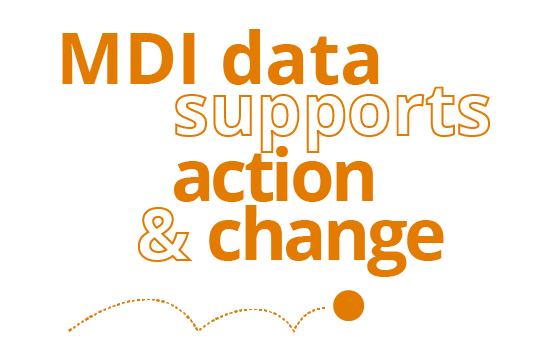 The MDI is not a rating tool or a report card. Even if your data isn’t what you’d like it to be, it’s important to first recognize what strengths are present and work to re-frame challenges as opportunities to build capacity. It’s important to remember that skills and habits are malleable — they can be learned and strengthened during middle childhood. This is especially true of social-emotional and relationship-building skills; research continues to identify programs and practices targeting these skills that demonstrate positive, long-term outcomes for children. Middle childhood is the perfect time to begin modeling behaviour, practicing social-emotional skills, and supporting new healthy habits. We also know that the assets that support middle years well-being are actionable — which means that we can intentionally build relationships with children, provide them with enriching after-school programs, and cultivate classroom and school environments that make every student feel like they belong. One of the core beliefs of the MDI is that children’s voices deserve to be heard. Asking children for their input is valuable because it provides us with rich data on child well being that we couldn’t otherwise access — data which we can use to create environments and interactions which help children thrive. It’s also powerful because it tells children that we value their thoughts and feelings, and grants them a say in how their schools and communities make changes to support them. 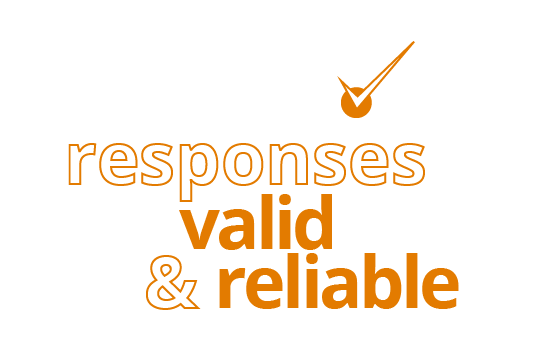 Research has found that responses from children in Grade 4 and above are as reliable and valid as responses from adults. A total of four studies were conducted to test the validity of the MDI survey, including two initial pilots in 2008, and two district-wide pilots in both urban and rural communities in 2009 and 2010. Results from these studies showed the MDI to have both strong reliability and validity. Data checks are repeated every year to ensure the data collected each year meets rigorous research standards. Check out our References section to review our pilot study and ongoing research publications.